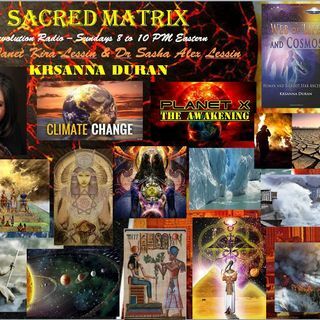 Krsanna Duran ~ 02/16/19 ~ Sacred Matrix ~ Revolution Radio, Studio B, Hosts Janet Kira Lessin & Dr. Sasha Alex Lessin ~ Producer Thomas Becker, 8 to 10 PM Eastern, 7 Central, 6 Mountain, 5 Pacific, 3 Hawaii time. www.revolution.radio - live and via the archives later. Polar Vortexes, Hurricanes, Earthquakes, Tsunamis, Volcanoes, Global Warming, Climate Change, Pollution, Nibiru (Planet X), Mini Ice Ages, Rising Seas, Sinking Cities surely exist to drive us crazy and send us scrambling ... Más informaciones for safety. The creation story, interactions between the Earth and other heavenly bodies, hybridization of human beings recorded in ancient texts, Sumerian tablets, the Bible and other ancient, holy and sacred writings and oral histories vary based on culture, content and context. What happened in the past and what can we do about it? Can we control ourselves long enough to stop the seas rising?